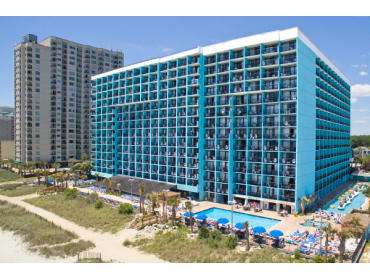 The oceanfront Landmark Resort offers a truly unique Myrtle Beach resort experience with 17 water features, year-round dining and more! Have an awesome vacation any time of year with the giant indoor pool complex that includes a large pool, fountains, hot tubs, a lazy river and splash zones for the kids. The summer season can’t be beat with the H2OASIS waterpark and free mini golf, as well as daily activities for the whole family. The amazing waterpark and enclosed parking garage are connected to the main resort by a convenient walkway. Grab your friends for a girlfriend getaway and save up to 35% off! PLUS you will receive the VMB Card at check-in, which offers discounts at area restaurants, shopping, shows and more! For more information call (855) 400-6927. 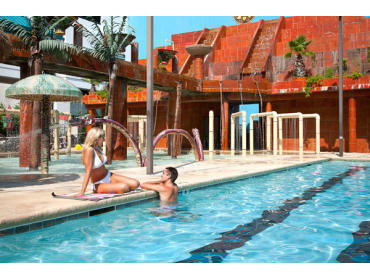 Landmark Resort - CCMF Resort Up To 32% Off + Discounted Tickets! Official CCMF Accommodations Sponsor! Save up to 32% off your stay when you visit for the 2019 Carolina Country Music Festival! Plus, add discounted VIP tickets when you book for even bigger savings! Enjoy on-site amenities such as the giant indoor pool, lazy river rides, large oceanfront pool, cafe proudly serving Starbucks coffee, H2Oasis Waterpark and more! For more info call (855) 400-6927. Landmark Resort - Easter Savings Up To 40% Off! Save up to 40% off your Easter vacation at our resort! On Easter Sunday, join us for breakfast with the Easter Bunny beginning at 9 am, scavenger hunt at 11 am, and jelly bean contest at 1 pm. 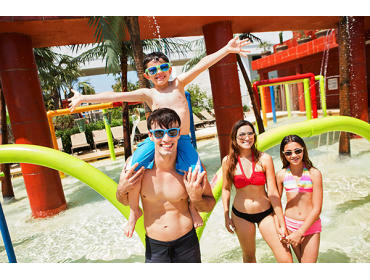 Also enjoy on-site amenities during your stay such as the giant indoor pool complex, indoor and outdoor lazy river rides, and seasonal H2Oasis Waterpark and putt putt! Call (855) 400-6927 to learn more! Landmark Resort - Summer 37% Off + Breakfast! Save up to 37% off and receive daily breakfast for two with our Beach & Breakfast Special this summer! Onsite amenities include the large indoor & outdoor pools, hot tubs, lazy rivers, fitness room, summer activities, cafe serving Starbucks, Gazebo Restaurant, Latitudes Grill, putt putt, H2OASIS Waterpark, poolside dining, free Wi-Fi, beach access and much more. For more info, call 855-400-6927. Landmark Resort - Summer FREE Night Special! 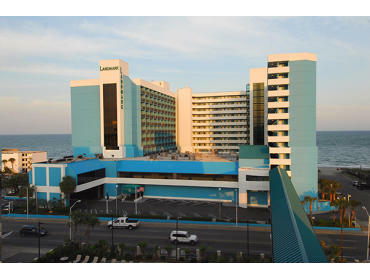 Pay for two nights and get a third FREE at Landmark Resort! Onsite amenities include the large indoor and outdoor pools, hot tubs, two lazy river rides, fitness room, summer activities, cafe serving Starbucks coffee, Gazebo Restaurant, Latitudes Grill, putt putt and H2OASIS Waterpark, poolside dining, free Wi-Fi, easy beach access and so much more. For more info, call (855) 400-6927. Stay 7+ Nights For Up To 48% Off For Our Canadian Neighbors! Our Canadian neighbors can receive up to a 48% discount through this special on stays 7 nights or longer! This is an ADDITIONAL 25% off our deepest rates! Enjoy our renovated indoor and outdoor pool deck, on-site dining, free Wi-Fi, seasonal putt putt and more! Must be Canadian citizen with valid Canadian identification.